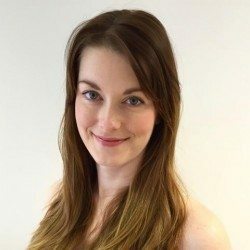 Join Mojo Pilates at West Lexham where you can relax, unwind and recharge. 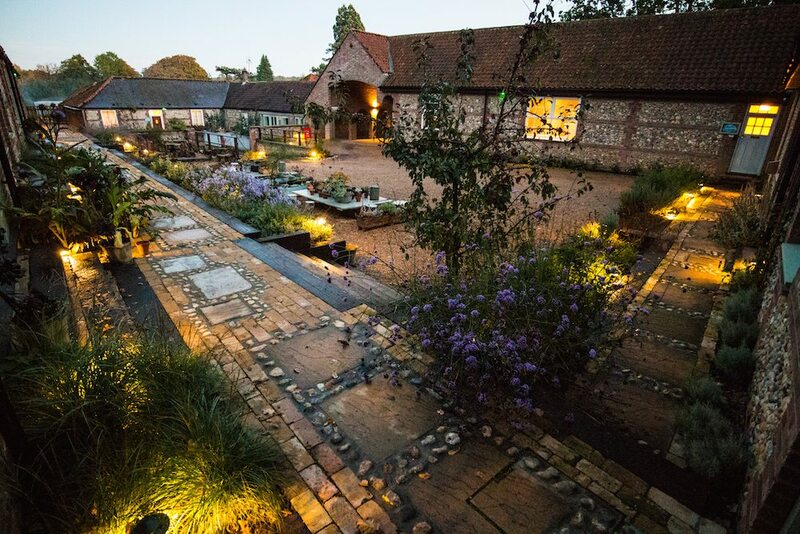 This really is a truly stunning venue set in a peaceful location among beautiful gardens and grounds. 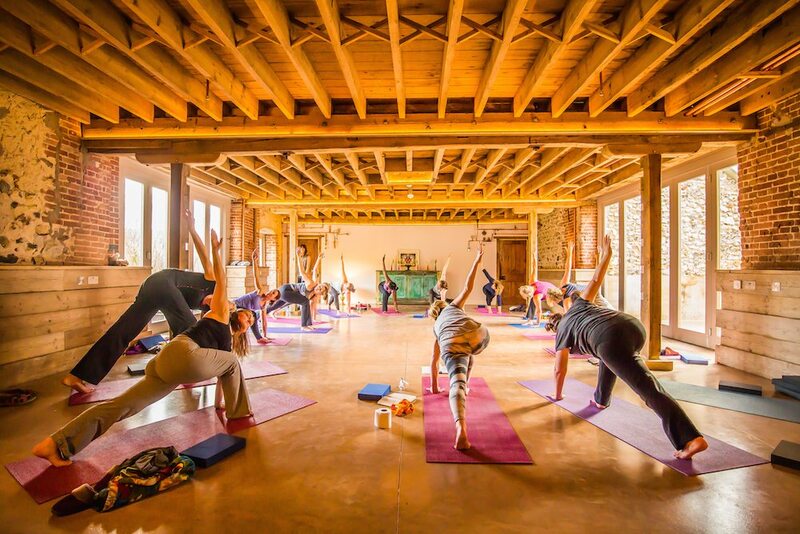 The Barn will be our home for 3 nights and 4 days whilst we enjoy Pilates morning, noon and night along with riverside and coastal walks, making the most of our enviable location. So what are you waiting for? Come and get your Mojo back! 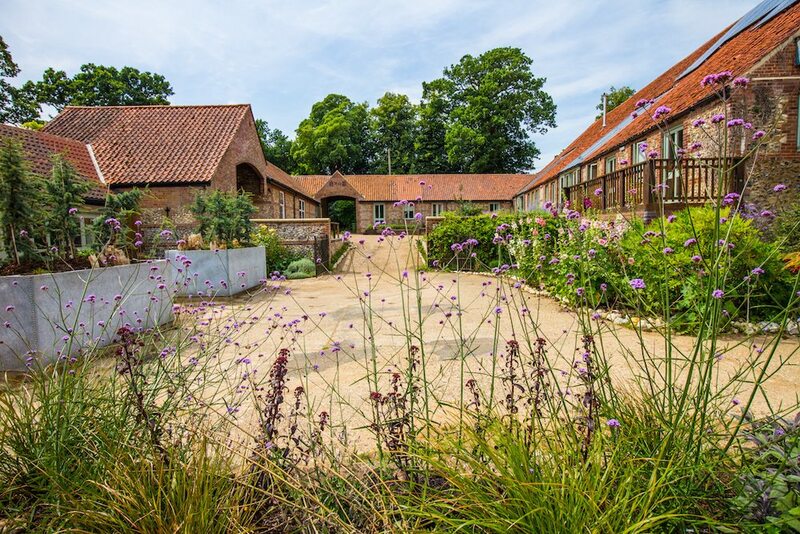 The barn is a superior retreat venue, housing a bespoke studio space (Harvest room), 13 en-suite bedrooms, conservatory, outdoor terrace and private gardens. Underfloor heating and polished concrete floors set against the original stone and beams make it refined yet contemporary. Huge sliding glass doors bring in the sunshine and open on to the garden on both sides. 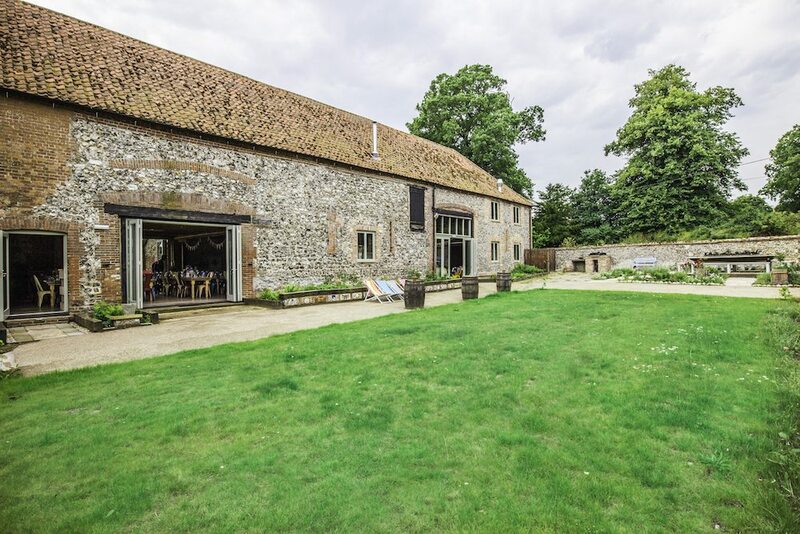 Superbly converted, the open-plan barn has retained its original character well, is spacious, light and flexible. 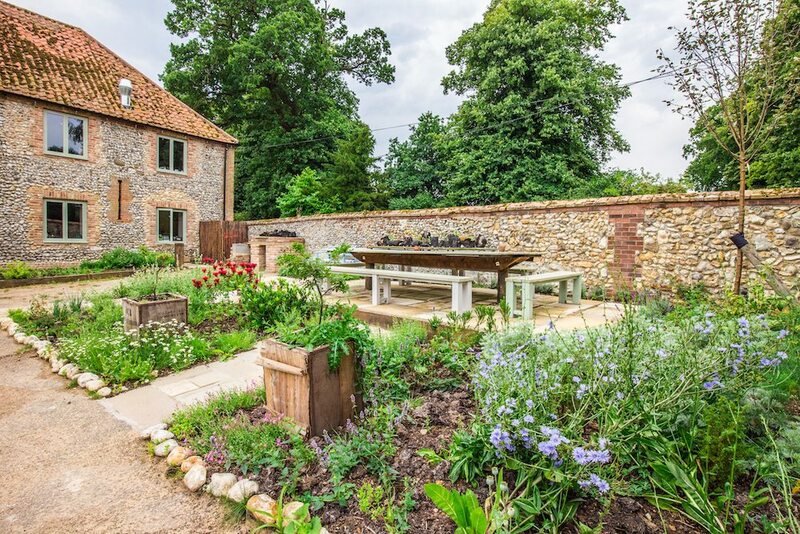 Built as a Grain Barn in 1805, West Lexham has restored all the original beams and the breathable lime and flint walls and added fully opening sliding glazed doors. 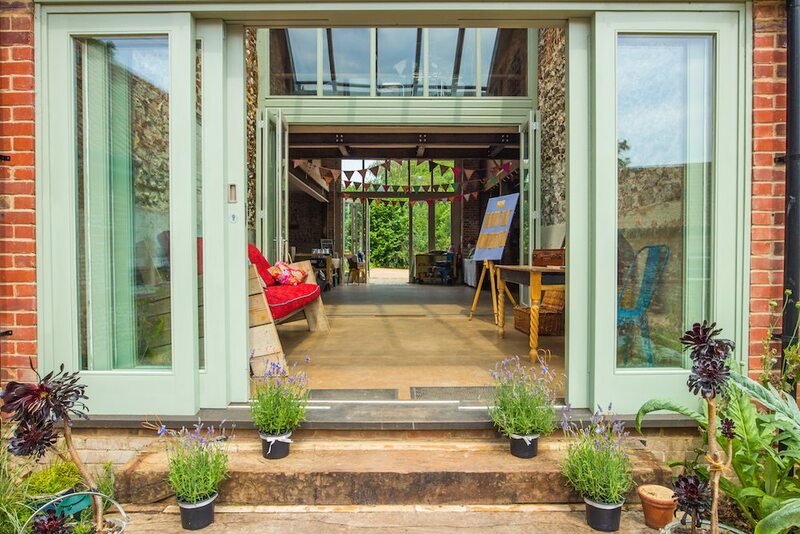 The barn has been filled with handmade furniture and it can be sectioned into separate cosy spaces or opened fully, giving all-important flexibility. 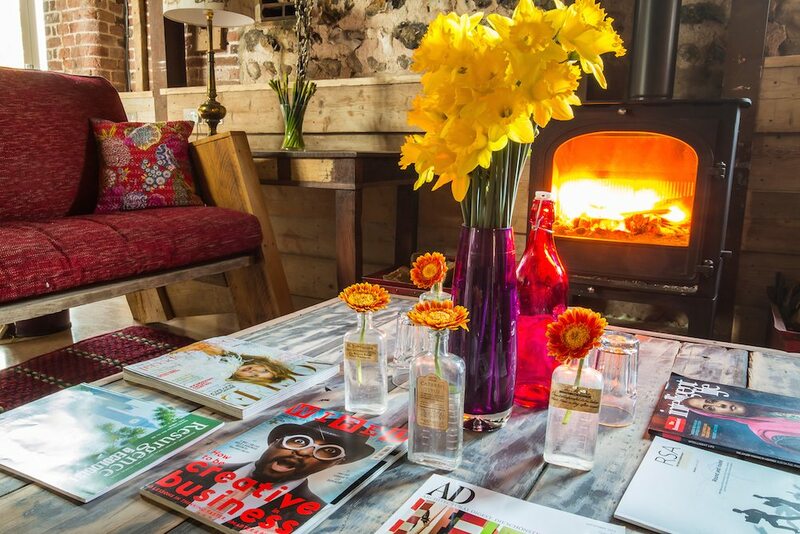 The rooms are gently warmed with underfloor heating by a biomass boiler burning local, sustainably managed woodchip. Together with the solar panels on the roof the venue is run almost entirely on renewable energy. This is where the magic happens…what a room! This can be opened into a huge open plan space. With the original ceiling in place, it gives the room an organic antique character. 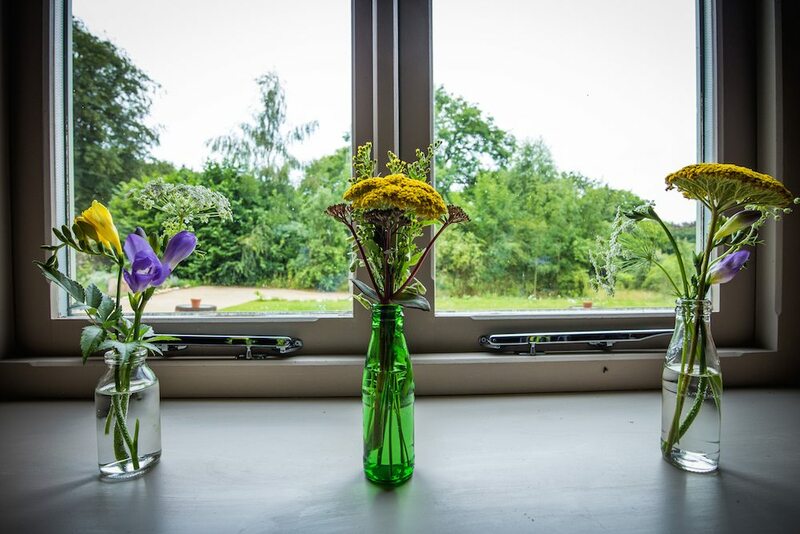 The harvest room will provide the studio space for our Pilates workshops yet can be sectioned into smaller spaces, providing cosy sitting rooms and dining areas. 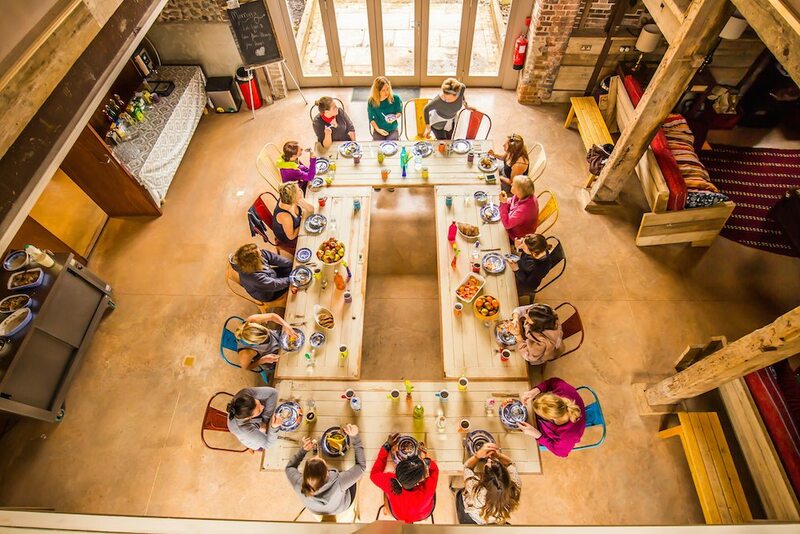 Underfloor heating and LED mood lighting create the perfect ambiance for our retreat. There are two floor to ceiling windows on either side that slide back to open into the garden and the conservatory. 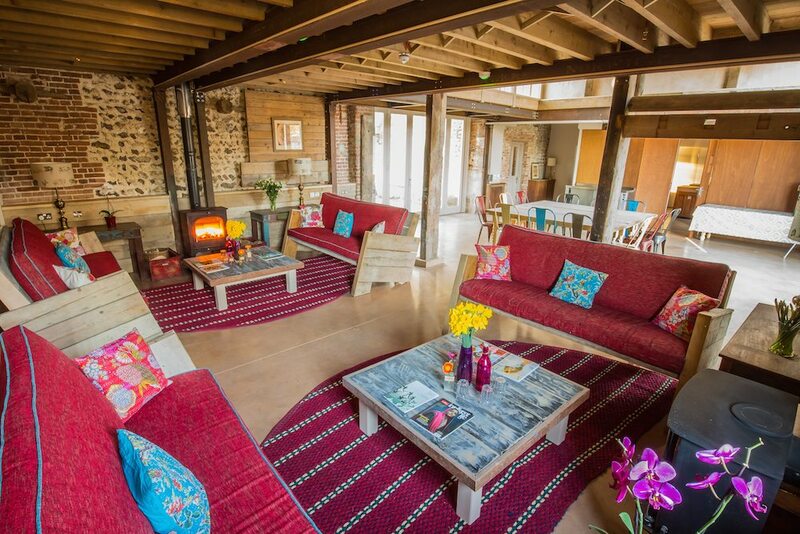 Four giant handmade sofas nestle around two raised log burners, with coffee tables made from the original wooden barn doors. 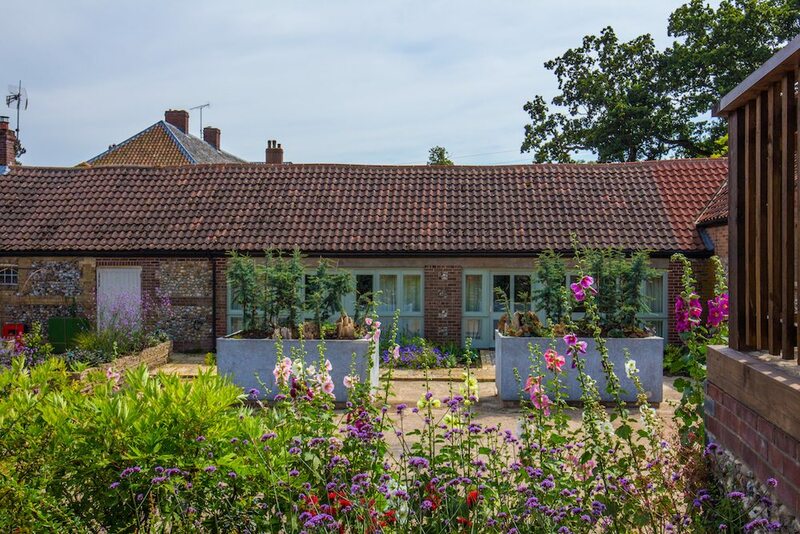 Complete with underfloor heating and mood lighting it has views into the studio space, gardens and conservatory. The flexible space makes this both a sociable venue yet gives you the privacy when you want it. The atmosphere and ambiance continue here. 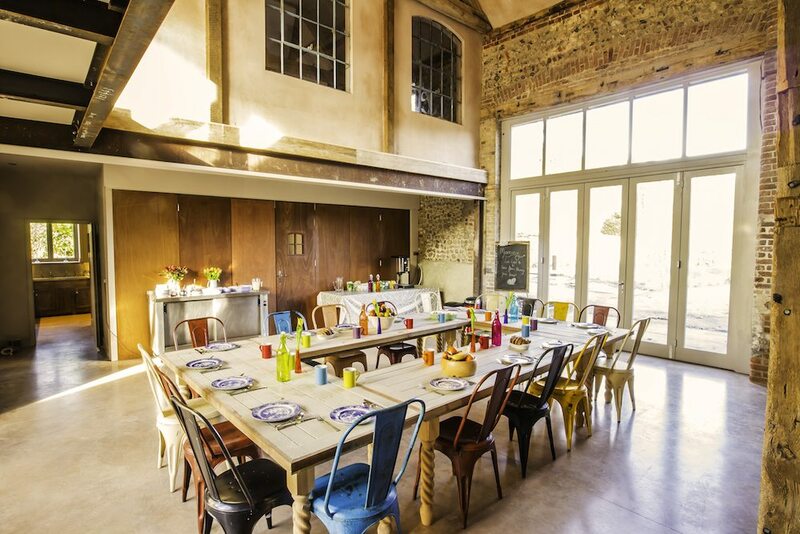 The dining area is the full height of the barn, complete with a balcony. 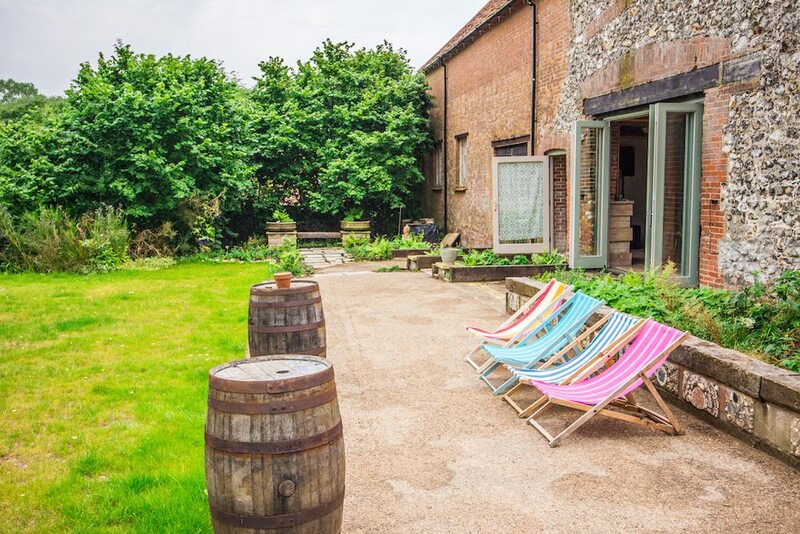 It is furnished with handmade tables from the original barn doors, and wonderfully coloured chairs, making the dining room vibrant and inviting. Giant windows either side open into the garden, terrace area, and conservatory. There is an entrance lobby with funky reclaimed lighting, rails for coats & shoes and 3 toilets. 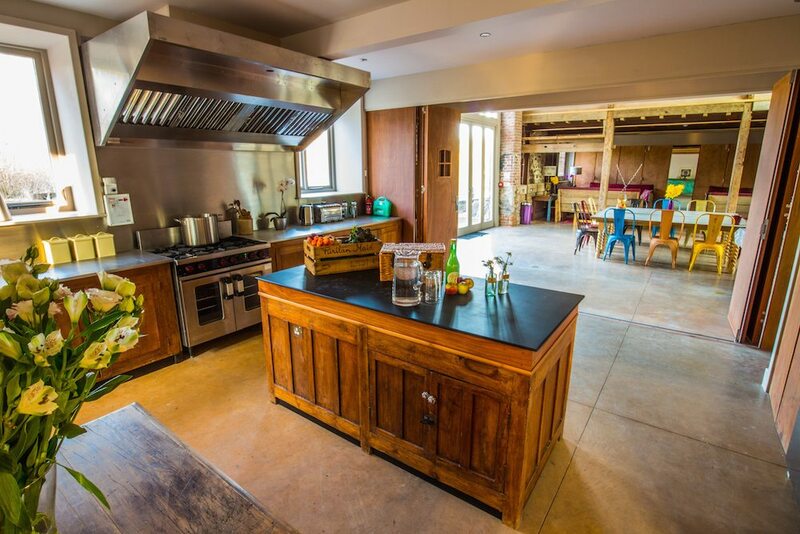 Tasty brunches and evening meals will be freshly prepared each day. Retreat guests will be invited to help themselves to light refreshments available outside of these times. All dietary requirements will be catered for with advanced notice. 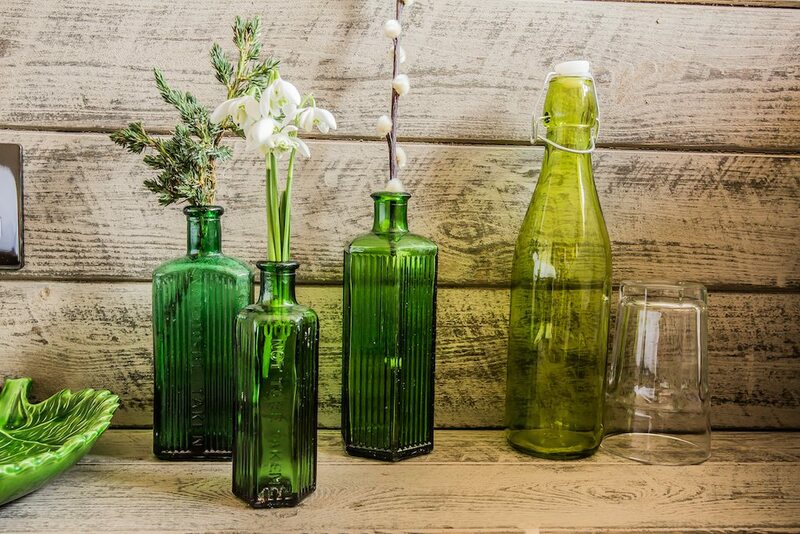 The kitchen is furnished with antique cupboards that used to be a Victorian science lab, very quirky with authentic charm! 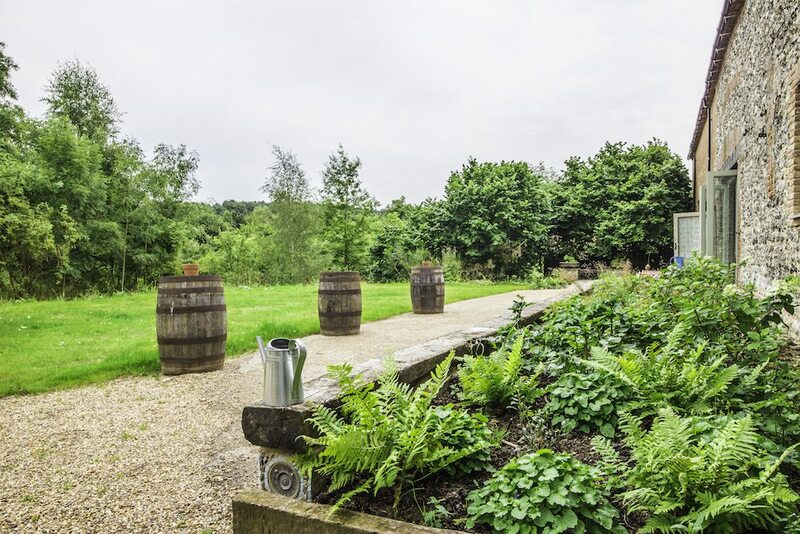 The water source at West Lexham comes from their very own well springing from the ancient chalk aquifer, giving crystal clear, energized mineral water. 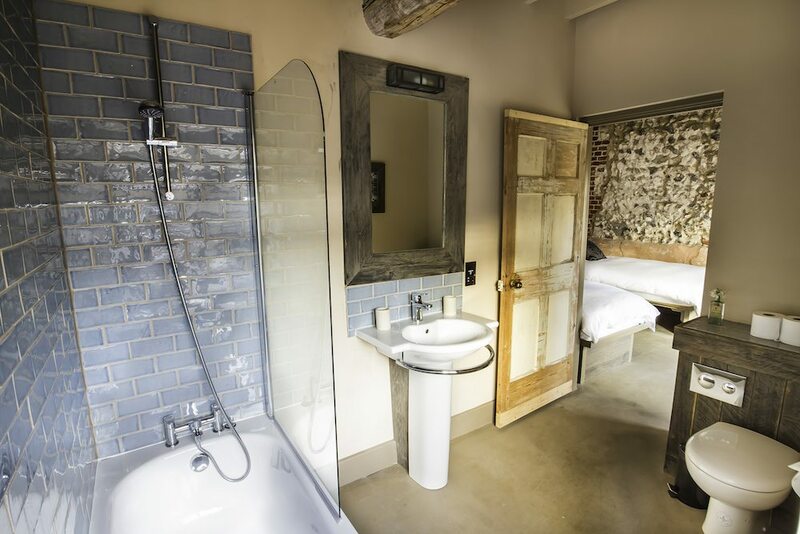 Our luxury en-suite rooms combine rustic charm with modern twists. 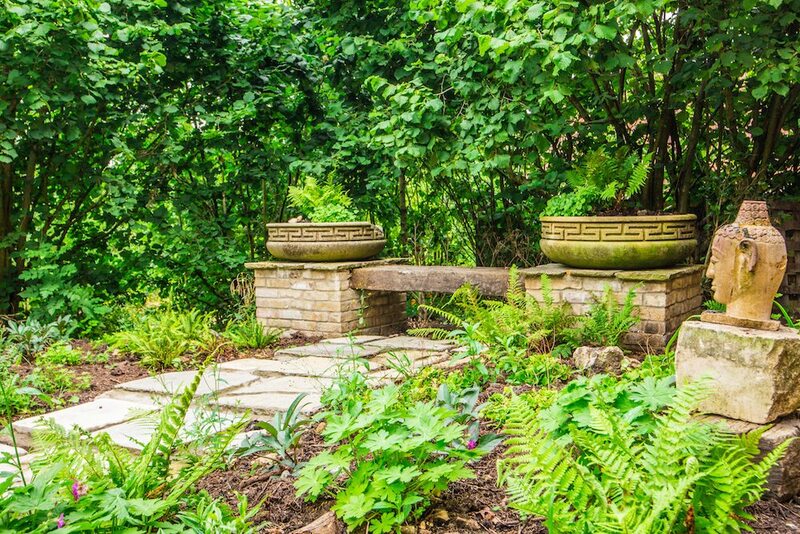 Many original features have been maintained and the materials used – wood, stone, clay – as well as the art decorating the walls reflect the myriad of nature that surrounds the buildings. 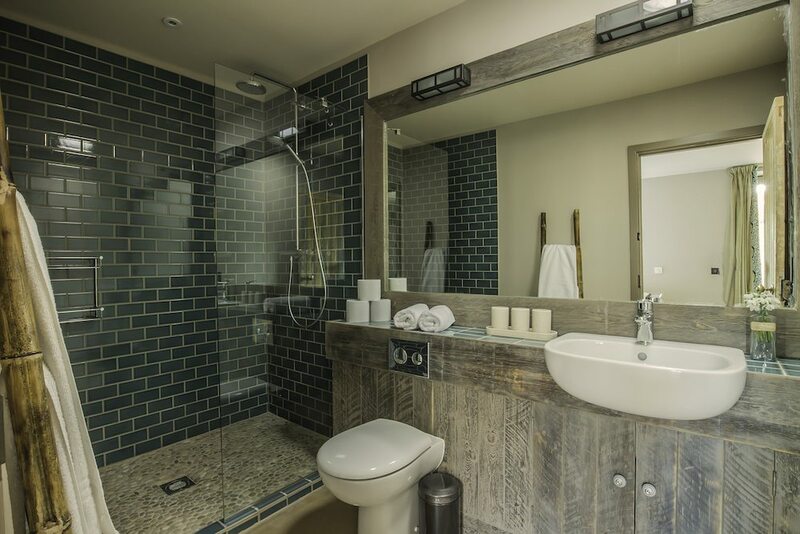 The underfloor heating and walk-in showers, complete with pebbled tiles to gently massage your feet give your room a touch of luxury. 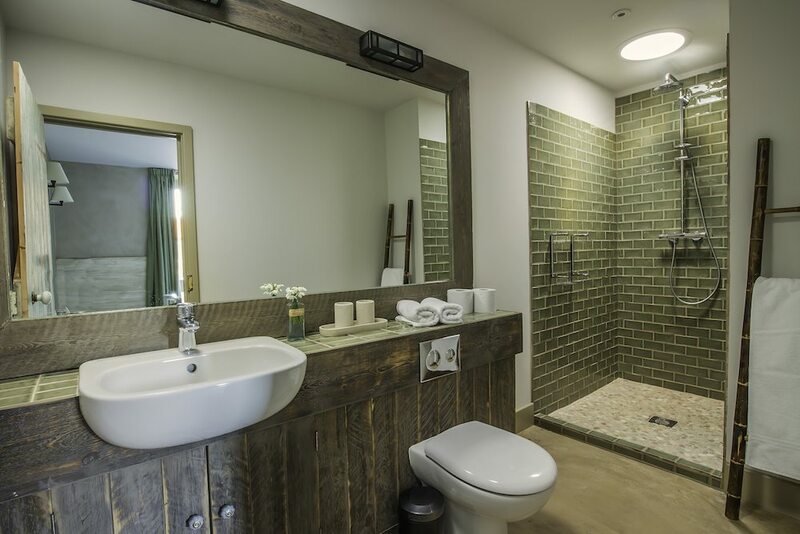 Three of the en-suite rooms have baths for a relaxing soak as well as a shower. 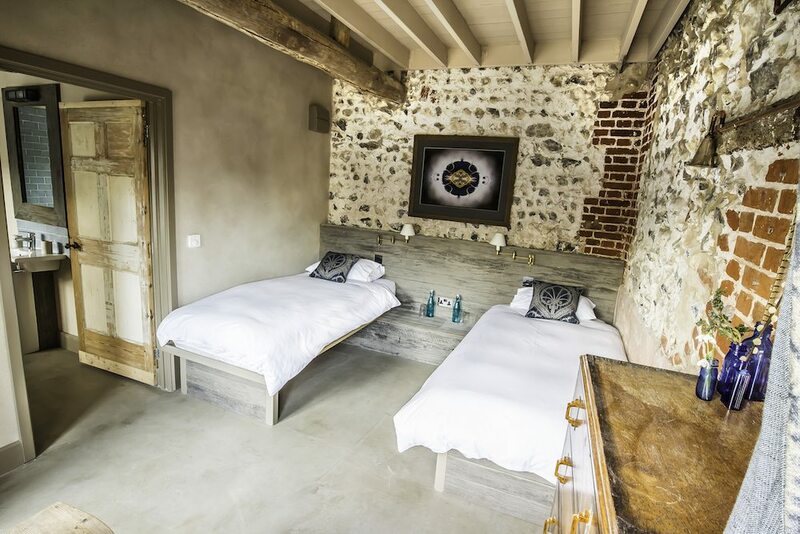 Some of the bedrooms have special clay plaster with crushed sea shells in it to create a sparkling effect all over the wall and a healthy breathability to the room. Others have the original brick and lime walls. 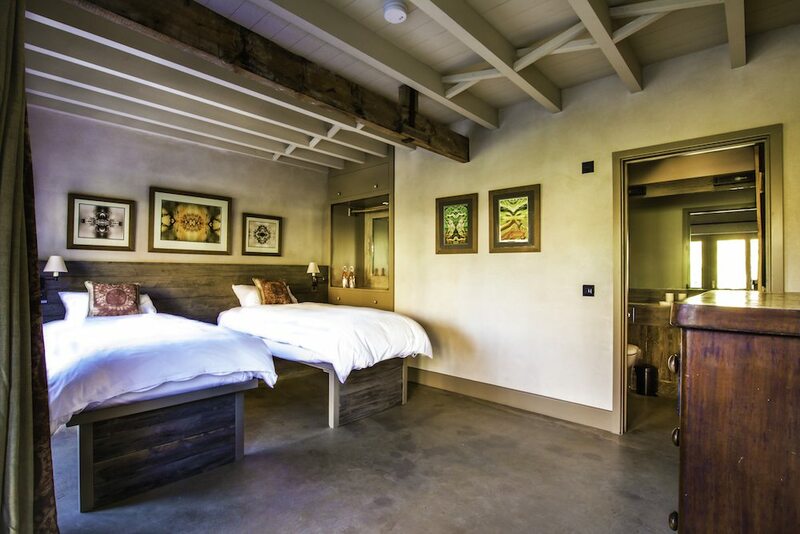 Reclaimed wood and original farm doors have been used alongside the original timber beams to add splashes of colour and authenticity to the rooms and each bedroom has original artworks by renowned artist Oliver Barnett. 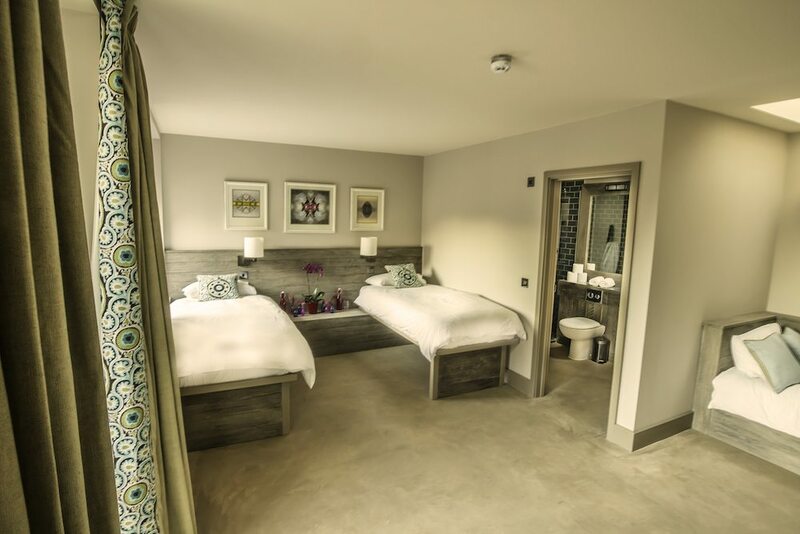 West Lexham has successfully given each room a unique interpretation of a natural scene, creating a perfect harmonious colour balance with the handmade curtains and cushions. 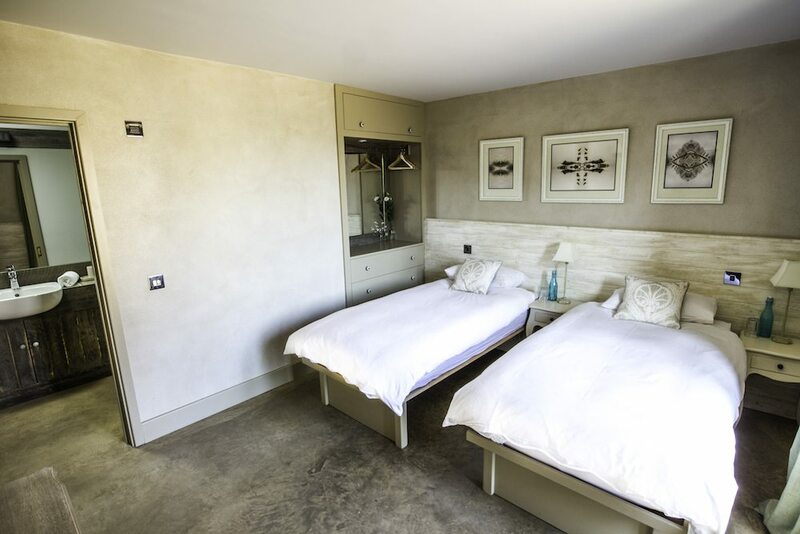 Even the beds have been handmade to fit super comfortable, extra thick sprung mattresses and are made up with high-quality cotton linen.The bedrooms are all named after heritage grains and cereal crops to honour the history of the granary barn, although in its hay day horses and cows were kept in these rooms! 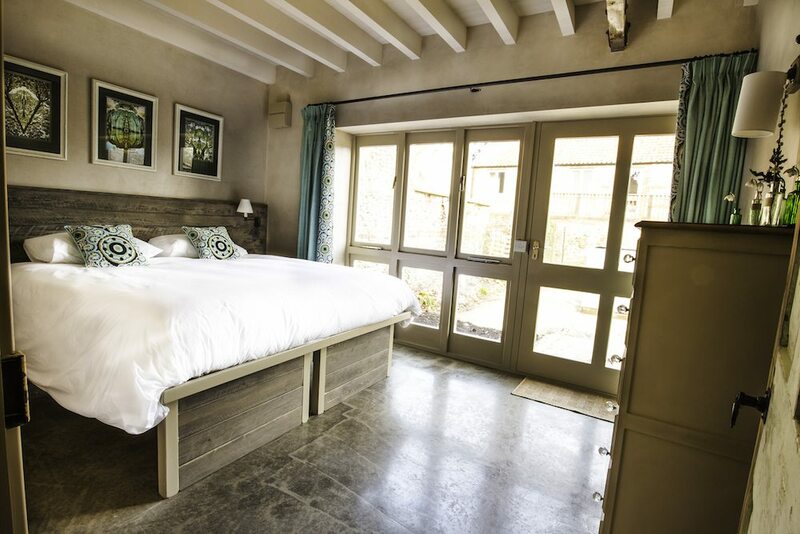 All bedrooms have their own private entrance and open on to a courtyard creating a quadrangle, embracing a sheltered garden with herbaceous borders, bonsai forests, an alpine garden, mosaic paths of flint and reclaimed brick and giant tables with silver birch seating and garden lighting throughout. 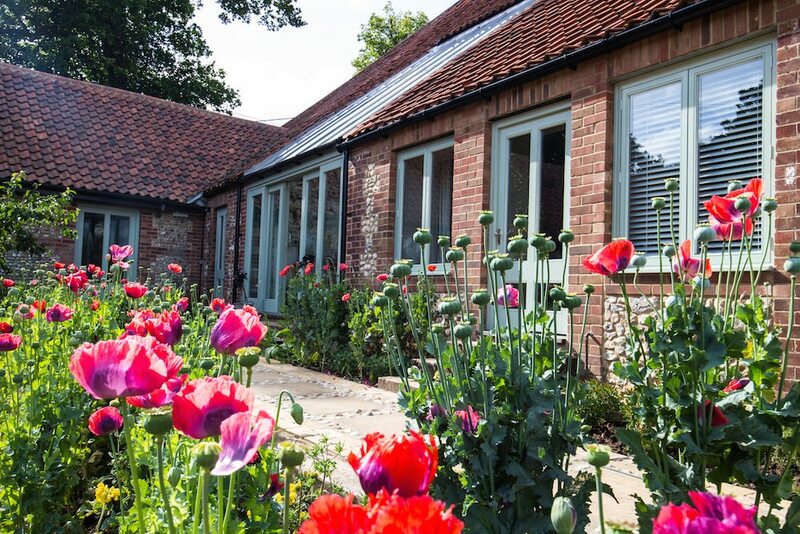 We have our very own private garden with conservatory, terrace, lawn, BBQ area and huge dining table set amongst the herbaceous borders and butterflies. 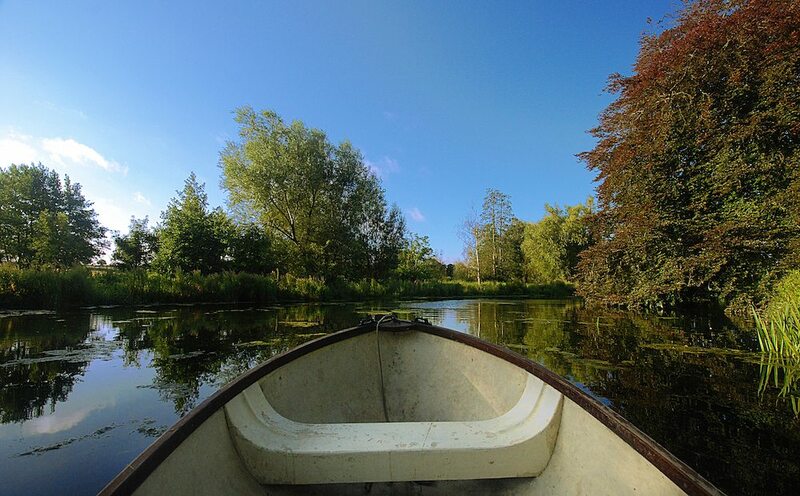 Take a stroll down by the river, around the wider grounds or row a boat across the picturesque lake. West Lexham is close to the Norfolk coast and there will be time to visit the beautiful beach at Holt. Whether you prefer to take a dip, grab an ice cream or just watch the world go by, it will be well worth a visit.